For the highest quality residential & commercial awnings, sun shades & sunscreens, Portland trusts the Waagmeester name! Waagmeester Canvas Products was found in Portland, Oregon by Bud Waagmeester in 1945. 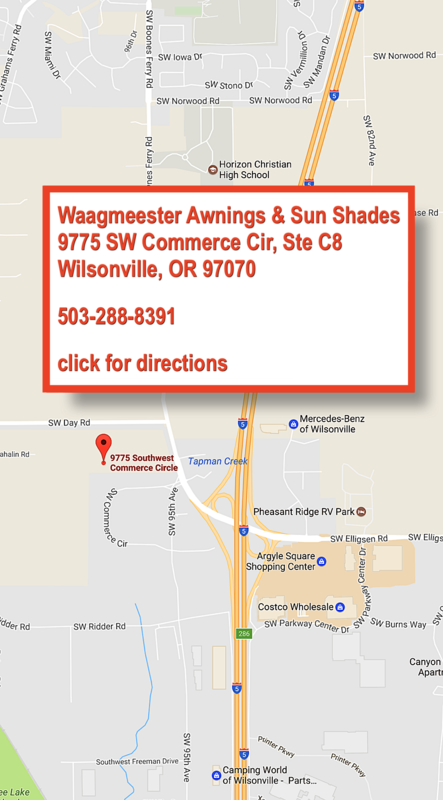 Since our founding, ​Waagmeester Awnings & Sun Shades has been, and is Portland's most trusted name in residential & commercial awnings, sun shades & sunscreens! For decades we supplied customers all over the US and across the world with premium quality awnings, sun shades, solar shade and numerous other canvas and fabric products. ​Going on nearly three quarters of a century, the Waagmeester family is staying true to our origins as one of Oregon's top family owned and operated businesses. With lots of hard work and support from our customers, we've grown beyond the city block we once occupied on Alberta Street in Portland! ​While we may have grown beyond our Portland building, Waagmeester Awnings & Sun Shades continues to design and create commercial and residential awnings for homeowners and business owners throughout the Portland metro and Vancouver metro areas. Our state-of-the-art Willsonville location gives us an even great capacity to product the very finest awnings, sun shades, shade sails and custom canvas creations for our customers in the Pacific Northwest and all over the world! In the summer of 2017 ​Waagmeester Awnings & Sun Shades moved from our long time home on Portland's popular Alberta Street to our new, state-of-the-art facility in Wilsonville, Oregon. ​While it was a little tough to say goodbye to the location we'd occupied for decades, our growth and the needs of our customers meant we needed a larger facility to allow us to do bigger and better things. The new home of Waagmeester Awnings & Sun Shades at 9775 SW Commerce Circle in Wilsonville is an impressive facility that helps the Waagmeester team continue to design and create the very best commercial and residential awnings and sun shades. We're also able to experiment and innovate on a grander scale, allowing Waagmeester Awnings & Sun Shades to remain at the forefront of the industry. Please feel free to visit us in Wilsonville and check out our showroom. A member of our team will be glad to show you options and designs to help perfectly compliment your home or commercial property.